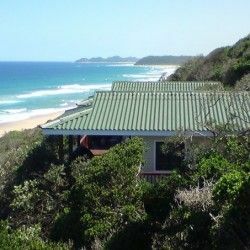 Aloha House 1 in Ponta Mamoli is a self-catering house situated on the beach, in a fairly private location north of Ponta Malongane. 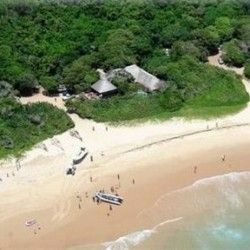 This typical Mozambique styled house - with a long fringed grass roof and tall ceilings allowing for airy interiors – can accommodate a total of 10 people in 4 bedrooms with en-suite bathrooms. The 4 bedrooms are separate to the main living/kitchen area. Each bedroom is accessed separately via glass sliding doors from the outside deck. The house has 2 sea facing, queen size double bedrooms with magnificent ocean views and 2 inland facing bedrooms which each have a queen bed and a single bed per room. All bedrooms have ceiling fans and bath towels are provided. The spacious open plan kitchen/living area is comfortably furnished with beautiful ocean views. The kitchen is equipped for self-catering and includes gas stove (no oven or microwave), large fridge/freezer and washing machine. The living area opens onto a wooden deck with a private swimming pool, gas braai facilities and comfortable recliners where guests can enjoy soaking up the sun overlooking the beach, a few steps down the private walkway. A further 7 minute walk along the beach is one of the premier snorkelling spots in the area. The charming Aloha House is perfect for those who prefer a secluded beach holiday, surrounded by pristine beaches, a warm sapphire blue ocean and the salty tang of cool sea breezes.